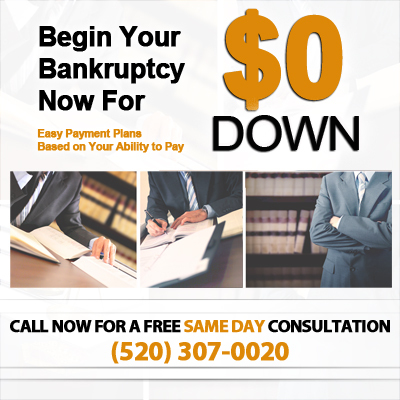 Tucson Bankruptcy Attorneys, Start with $0 Down. Call! Stop foreclosures. Stop collections. Protect your assets and interests to get a fresh financial start! The legal remedy of bankruptcy can stop foreclosures and the collections and calls from creditors. We also work with individuals and businesses to keep you out of trouble with important business and residential real estate transactions. Tucson Bankruptcy Lawyers in Arizona. Our Affordable Tucson Bankruptcy Attorneys provide free consultations for anyone seeking debt relief in Tucson, Pima County, and surrounding communities. Speak with one of our experienced bankruptcy lawyers today. At the Tucson bankruptcy law office of the My AZ Lawyers our dedicated bankruptcy lawyers and staff provide an informal and welcoming atmosphere, as our legal team want you to feel comfortable and at ease while working out solutions for difficult issues that you may be facing. Many of our clients are facing foreclosure, repossessions, and wage garnishments. We offer first class legal representation for an affordable fee, and we pride ourselves on successfully guiding our clients through such a difficult period in their lives. Many people in Tucson, Pima County, and throughout Arizona file for both chapter 7 and chapter 13 bankruptcy protection. Some of the reasons that people have to declare bankruptcy include: medical bills, divorce, loss of a job or income, overwhelming credit card debt, or being upside down on a mortgage or vehicle. If you are struggling to keep up with your debts and find yourself spending your days and nights worrying about money, you should seek the assistance of a Tucson debt relief expert. An experienced bankruptcy lawyer can tell you the real story and give you the facts. Don’t let bankruptcy myths prevent you from making a decision that could significantly improve your quality of life. Don’t you deserve a “fresh start”? Contact Tucson Bankruptcy Lawyers right away and find out if filing for bankruptcy protection in Tucson is the right choice for you. Our costs for filing bankruptcy can’t be beat. We offer the most client-friendly payment plans available. Check out the un-matched rates for filing bankruptcy with our Tucson bankruptcy lawyers. *** We can file your Tucson Chapter 7 case for $0 in legal fees before filing. *** We can file your Tucson Chapter 13 case for as low as $200 in legal fees before filing. There is no gimmick here! This simply works like this: We review your situation, give you a detailed recommendation, then offer you a payment arrangement that will work ideally for your financial situation. When we say $0 down, that is exactly what it means. No money out of your pocket and you get financial relief. Also, zero dollars to make the phone stop ringing with creditor harassment. Plus, zero dollars to stop a wage garnishments that could financially cripple you. There are so many people in Tucson and Pima County who are desperate to get out of debt and desperate for the creditor harassment to stop. These people would love to file for bankruptcy and get a fresh start. However, they are unable to get the up-front costs together so they can file for bankruptcy. In an attempt to help out these people we decided that we could help and make it easier to get the means together to file for bankruptcy protection. We simply lowered the amount necessary to file bankruptcy and everyone is benefiting from our $0 Down to file bankruptcy. Chapter 7 is the most popular of the bankruptcy chapters. We can, in most cases, file your chapter 7 bankruptcy for $0 in legal fees (you only pay the $335 bankruptcy court filing fee to the bankruptcy court) AFTER filing, you will make low monthly payments that you can afford for the post-filing work. In a Tucson Chapter 13, the remainder of the lawyer costs can usually be paid through your Chapter 13 bankruptcy plan. In a chapter 13 bankruptcy, you usually make monthly payments in your chapter 13 plan. Payments may be as low as $100 per month depending on your assets and expenses. If you qualify for our $0 down program, you quickly get the help you desperately need immediately. Call us now and get set up for a free consultation with one of our Tucson debt relief attorneys. There is no risk, you get to talk to us for free and get professional advice about your financial situation. CALL US TODAY FOR A FREE CONSULTATION!!! Tucson, Arizona is a heavily populated area. Arizona’s 2nd largest city is made up of people from many different backgrounds who are faced with many different financial problems. There are many Tucson bankruptcy attorneys who can assist you with your current Tucson financial situation. Seek the assistance of Tucson Bankruptcy Attorneys and Bankruptcy Lawyers in Tucson, Arizona. The 32nd largest city in the United States and the 2nd most populated city in Arizona, Tucson is estimated that the city has a large population of about 548,555. Tucson is one third the size of Phoenix, and not as surrounded by populated cities like the Phoenix metro area. The economy has caused many people to lose their jobs which set off an era of people who could no longer make payments on their debts. The Tucson bankruptcy attorneys from My AZ Lawyers will be more than happy to provide any individual, couple, or business in Tucson and Pima County the proper information about debt relief and bankruptcy. Additionally, each bankruptcy case differs and that is why you need to make an appointment with My AZ Lawyers for a FREE consultation. We also offer free consultations either in our office located at 2 East Congress Street in downtown Tucson, Arizona. When you converse with a bankruptcy lawyer in person or by phone, they are able to give you advice that is geared to your particular needs. Many of the Tucson bankruptcy attorneys will offer you free consultations. Find a Tucson bankruptcy lawyer that you are comfortable working. There are certain rules geared to the bankruptcy laws in Arizona. These laws do not necessarily mean that you won’t fit into one of the bankruptcy chapters. A bankruptcy lawyer in Tucson, Arizona knows the laws for both the Chapter 7 Bankruptcy and the Chapter 13 Bankruptcy requirements in your area. It is always a good idea to retain an experienced bankruptcy lawyer when considering declaring bankruptcy in Tucson, Arizona. Chapter 7 bankruptcy completely wipes away your debt and allows you to become completely debt free. In a Chapter 13 bankruptcy you will have to pay back a small percentage of your debt. We realize that there are many things that a person filing bankruptcy in Tucson, AZ might want to ask their Tucson bankruptcy Attorney. Everybody has a different situation with their property, family, and finances. That is why you use the services of a Tucson bankruptcy attorney located right in Tucson and not try to file the bankruptcy in court yourself. It is true that you can get the paper work and file bankruptcy for yourself. It is not recommended. In order to make sure that you are properly covered with all your debts, you should seek assistance. Hiring a Tucson bankruptcy lawyer will limit future problems. Not initially hiring an attorney could end up costing you more in the long run. Bankruptcy mistakes are very common with people filing for bankruptcy on their own. ** Pima County Bankruptcy Lawyers. **Tucson Bankruptcy Attorneys. ** Bankruptcy Lawyers in Tucson, Arizona. ** Affordable Tucson Bankruptcy Attorneys. ** Pima County Debt Relief. The Tucson Bankruptcy Attorneys of My AZ Lawyers with locations in: Tucson, Phoenix, Mesa, Glendale, Scottsdale, Avondale, and Tempe. Represent clients in Tucson, Marana, Sierra Vista, Phoenix, Tempe, Glendale, Mesa, Chandler, Sun City, Gilbert, Peoria, Surprise, Avondale, Apache Junction, Scottsdale, Paradise Valley, North Phoenix, Queen Creek, Apache Junction, Casa Grande, Anthem, Prescott, North Scottsdale, South Tucson, Sedona, Flagstaff and other communities in Maricopa County, Pinal County, Yavapai County, Pima County, Coconino County and throughout Arizona. Bankruptcy Lawyers in Tucson. Tucson Bankruptcy Attorneys.